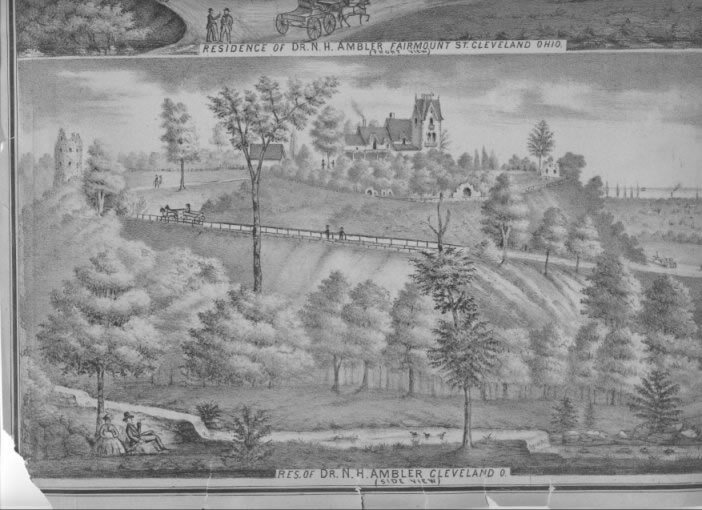 Ambler Heights—one of Cleveland’s most beautiful and bucolic enclaves, and among Northeast Ohio’s first “garden suburbs”—was the brainchild of Dr. Nathan Hardy Ambler and his son Daniel Caswell. Ambler made his fortune during the California Gold Rush, largely by accepting gold dust in exchange for the dental work he performed on miners. He also dealt in real estate, buying property on the outskirts of Cleveland and reselling it as the city grew. By 1872, Dr. and Mrs. Ambler had built a large home called Rock Rest on a hill between the present Fairhill Boulevard and Cedar Avenue (just southwest of Ambler Heights), now the site of the Baldwin Filtration Plant. Shortly after the Civil War, Ambler and his adopted son, Daniel O. Caswell developed Blue Rock Spring House, a water cure resort/sanitarium which operated until 1908. Ambler died in November 1888 and is buried in Lake View Cemetery. Rendering of the Nathan Ambler estate (now the site of Baldwin Reservoir) around 1875. The foregound is basically the ravine separating what is now North Park and Fairhill (Stokes Blvd.). The drive where the carriage is ascending is roughly where Fairhill/Stokes currently runs. Note the "indian tower" at upper left (actually an observation tower build by Ambler). During the 1890s, land owned by the Amblers south of Cedar Glen Parkway and west of Doan Brook was largely undeveloped. By 1892, it had been platted as “Ambler Park,” in which there were to be several large lots along the top of the ravine, in addition to with many more, much smaller lots laid out in a north-south, east-west grid pattern. In 1894, Ambler’s widow, Martha, donated 25 acres south of what is now North Park Boulevard for Ambler Park. Ambler Parkway (now North Park Boulevard), running through the park, was surveyed in 1895. Around 1900, Daniel Caswell hired Charles W. Pratt to lay out “Ambler Heights” for marketing to an upscale clientele. Pratt laid out a neighborhood for comfortable living, with wide, gently-curving streets. At the north boundary ran Patrick Calhoun’s street railway extension. Immediately to the east were the links of the Euclid Golf Club. Lots were generous and irregularly shaped to accommodate natural features. Leaders of the Cleveland business community soon built homes, including Benjamin Bourne, president of the Bourne-Fuller Company, and George Canfield, president of the Canfield Oil Company. They were followed by other prominent families, including those of Joseph O. Eaton, chairman of the Eaton Axle and Spring Company, and Samuel Halle of Halle Brothers Department Stores. By 1912, 31 homes had been built in Ambler Heights. By 1920, Ambler Heights included about 56 homes of similar style and quality. By 1927, building of the district was largely complete.